First off, I must say, this is quality music we’re talking about here. 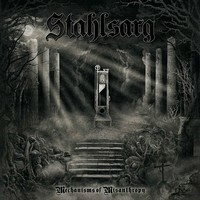 Stahlsarg comprising of four warriors sure do know how to make good Black Metal. Their second output ‘Mechanisms of Misanthropy’ on Non Serviam Records with ten anthems of warring Black Metal is a huge aural assault on my ears yet at times I feel this calm feeling like the calm before the storm. It took me at least three spins of their promo CD before I decided to write this review. So, let’s have a brief overview of this particular work of Stahlsarg. What makes a good BM? Well, for me personally, all it takes to make a good BM is the overall feeling that the work conveys. The harsh sound, the wall of noise, the speed and the intensity, the calm parts, the climb and the dive that the album takes you. ‘Mechanisms of Misanthropy’ has it all. On the outside, it is a big war anthem from the beginning to the end. On the inside, it is a journey that the band wants you to go through with them. The band describes their music on their promo sheet as ‘the music that is used to highlight stories of a time of oppression, resistance, survival and death. From the fast to the melancholic and from the bombastic to magisterial, they create atmospheres to maximize the hard hitting lyrical contents’. Well, I couldn’t agree more! All the ingredients of good BM are here. Good productions where you can hear all the instruments. The composition are a combination of technical and melodies. There are a lot of this ‘beautiful’ (for lack of a better word) parts where you would just stop your headbanging and give your neck the rest it needed while you savour the melodies. Doomy and sombre melodies that really gets into you. I especially like their guitar sounds. The rhythms are razor sharp-buzzing sound while the tremolo-pickings and the leads that they employ are simply a delight to the ears. This band really knows how to compose powerful melodies. The songs are structured to convey their message and their feelings. They did it well enough for me. I would listen to this compositions many many more times and I recommend that you do the same if you are interested in blackend death metal or black/death metal musick. This is highly contagious! Anyways, Stahlsarg is a common listen to the likes of Marduk (latter days) and Enthroned (Belgium) to name a few. Ave!